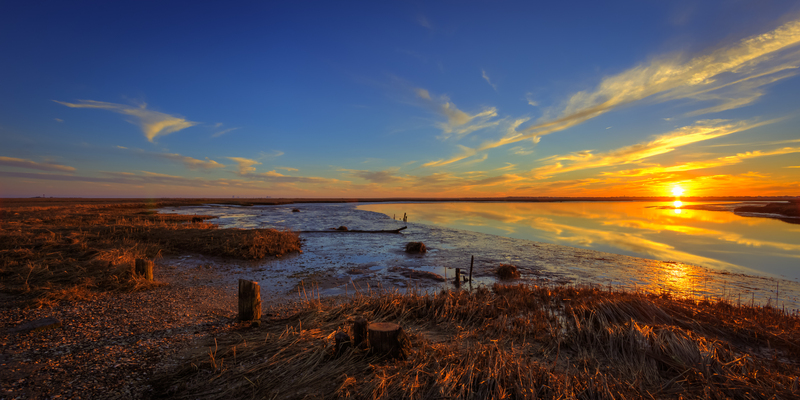 Friday evening, about 20 minutes before I made this, some primetime golden hour light was pouring over the salt marsh along Great Bay Boulevard. Better yet, the clouds were decent with the tide dead low and dead calm. All signs point to decent photo making when these conditions are met. Compositionally my goal was to key off the remnant bulkheads—the roughly 1 foot in diameter stumps of wood you see aligned at an angle about the foreground—while conveying the extent of the dead low tide. To do this I kept my tripod higher than usual, putting the camera body about 5 feet off the ground, giving me enough angle on the marsh. More often than not I tend to get low and close when shooting wide angle—this makes closer objects appear more dramatic (re: large), but limits your ability to push the viewers eye depth further out toward the horizon. In other words, if I was crunched down here as usual, the tidal exposed marsh and the still water to its right would appear as much thinner strips. However, the bulkheads would be given much more visual weight. These are the kinds of decisions you have to make when you approach a scene. What am I trying to convey? And then, perhaps more importantly, what concessions do I have to make to achieve said conveyance? This is where I cannot advocate trail and error experimentation enough in an era of digital. But it’s not all faeries and roses here. Due to the extreme angle I placed the sun—setting it to the outer sixth of the frame—chromatic aberration and lens flare marks the horizon from right to left in several spots. While I’m not sure if it’s a bad thing, I’m fairly certain it’s not a good thing. Ultimately I will leave this up to the subjectivity of the viewer. At the very least I should concede this effect was not intentional.